Remember when full-size truck-based SUVs were the environmental equivalent of the antichrist? Hummer was the "Chucky" poster child brand of everything automotively evil, and its 2010 demise at least partially due to socially falling out of favour with the do-gooder elite that helped it get a foothold in the mainstream market in the first place. 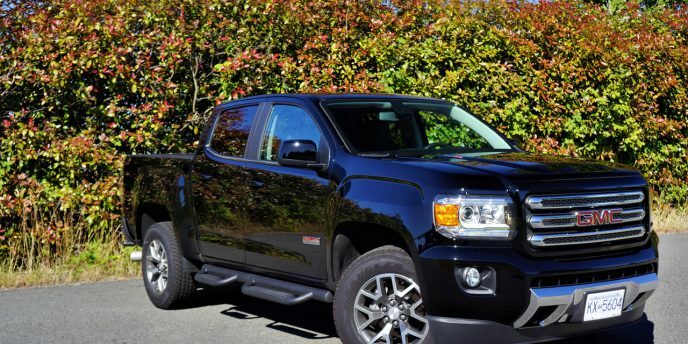 Remember when full-size truck-based SUVs were the environmental equivalent of the antichrist? Hummer was the “Chucky” poster child brand of everything automotively evil, and its 2010 demise at least partially due to socially falling out of favour with the do-gooder elite that helped it get a foothold in the mainstream market in the first place. That would be pre-California governator Arnie Schwarzenegger in the driver’s seat, the real Col. John Matrix even influencing the design of GM’s Tahoe/Yukon-based H2 before turning up personally to introduce it in concept form at the 2001 New York auto show. Not long after it became politically incorrect to be seen in anything so carelessly gluttonous with fossil fuels (he first ran for governor in 2003 and was elected in 2006), a photo of Arnold spinning a globe of the world on his finger with the words “Save the Planet — Or Else” on the cover of Newsweek comes to mind. His environmental scorecard wasn’t exactly agent orange, but then again it wasn’t anywhere near as green as predecessor Gray Davis’ agenda, or for Jerry Brown that both preceded and immediately followed, but the True Lies star had to at least look more steward than predator. Not anymore. Arnold drives an even bigger military grade Hummer H1 now, while relatively cheap gas and even cheaper money has caused a spike in the number of big SUVs leaving domestic and imported brand showrooms. Only Toyota’s Sequoia (What’s that you ask?) has taken a downturn in recent years, with every other full-size mainstream branded SUV having had its best year in a very long time in 2016, if not its best year ever. GM dominates this segment, with 10,681 Chevy Tahoes/Suburbans and GMC Yukons down the road last year, while the next-best Ford Expedition found just 3,729 buyers. Nissan’s new Armada saw considerable growth in 2016 with 716 sales, whereas the aforementioned Sequoia dropped to 697 units. 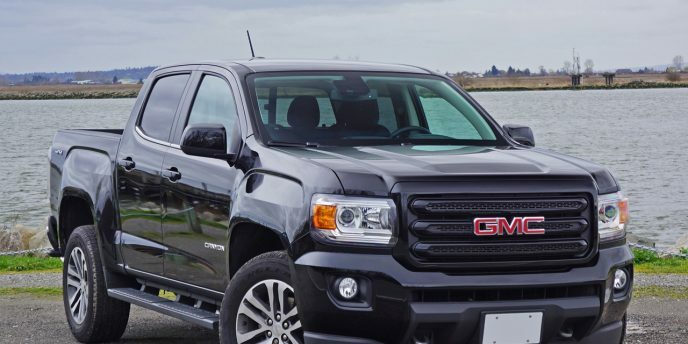 Here in Canada, GMC regularly outsells Chevrolet in the full-size SUV category, with last year’s totals being 5,446 units compared to 5,235, whereas it’s a much bigger gap in the opposite direction in the U.S. market where Chevy sold a total of 163,388 Tahoes and Suburbans to GMC’s 90,501 Yukons for a much greater per capita total of 253,889 units. Just for fun, can you guess how many plug-in hybrids and full-electric vehicles sold during the same 12 months? Out of 30 unique offerings, U.S. sales totalled a mere 159,139 units, and that’s after baiting customers with mega government handouts. So much for the environmental movement hitting the mainstream. To GM’s credit its Chevrolet Volt was a major player on that list of 30 plug-in models, while the new Bolt EV is a very real, affordable electric that consumers can buy now—no jab at Tesla intended. These (likely) money-losing bowtie projects are funded by the aforementioned high-profit SUVs, as well as even higher profit pickup trucks, ultra-popular crossover SUVs, and a number of strong selling conventionally powered cars (the new Malibu is superb, by the way), which is just another reason for Arnie and company to embrace the big SUV. Don’t get me wrong. I fully respect and appreciate Arnold Schwarzenegger; I loved Hummer, especially the final H2 and H2 SUT while rock-crawling around Aztec, New Mexico in 2008; and I adore the Yukon, especially this mammoth Yukon XL, GMC’s version of the 14-inch extended-wheelbase Chevy Suburban, making both 20 inches longer overall and more than doubling cargo capacity behind the third row. 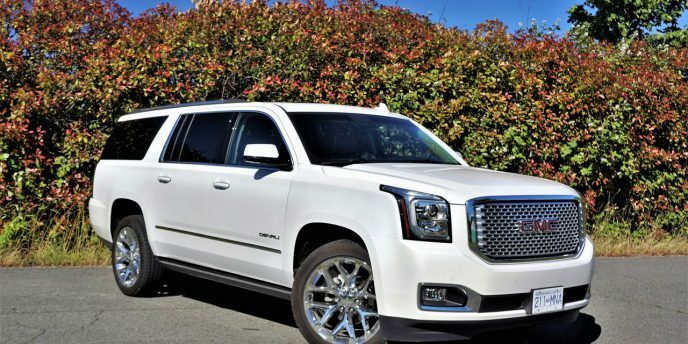 The Denali is even better, coming close to the ultimate Cadillac Escalade ESV experience without the, “In yo’ face mutha f…” hip-hop star attitude. Its massive 420-horsepower 6.2-litre V8 feels like it’s got enough twist on tap to spin the world in the opposite direction when accelerating westward, its standard 275/55R20 or even meatier as-tested 285/45R22 rubber churning asphalt from all four corners via an efficient eight-speed automatic fed by 460 lb-ft of torque. Despite pushing 2,605 kilos (5,743 lbs) of bulk it feels light on its feet, but I best not go into driving dynamics details before the upcoming road test or this wouldn’t be a “Garage” teaser story, now would it? I will fill you in on some 2017 updates, mind you, a new “Teen Driver” feature allowing some parental guidance when the big ute is out of site with kids at the wheel. Safety issues in mind, low-speed forward automatic braking is now optional on lesser models and standard with the Denali, while all trims get new active front aero shutters to improve highway economy. I thought you’d never ask. 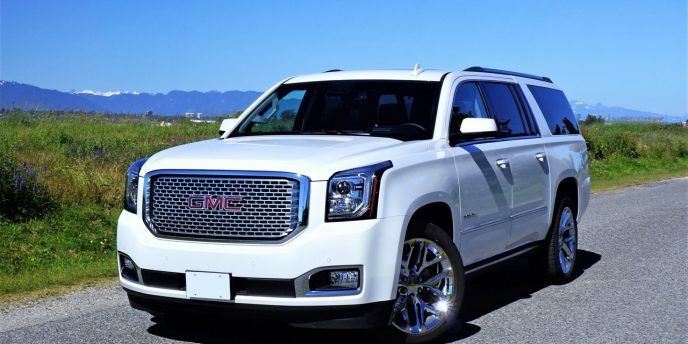 The Yukon XL is five-cycle Transport Canada rated at 15.1 L/100km city and 10.4 highway with the base 5.3-litre V8 and RWD, while that engine with 4WD is good for a claimed 15.2 city and 10.8 highway. 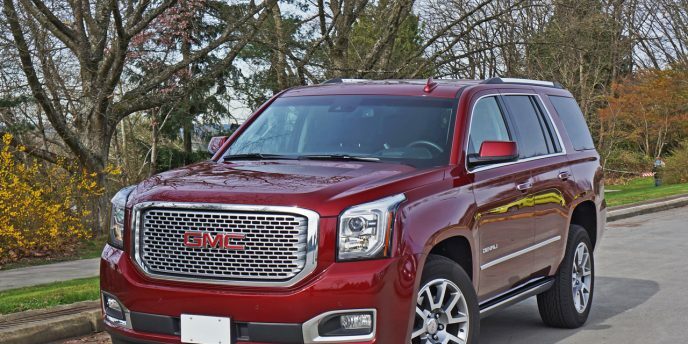 The as-tested Yukon XL Denali gets a 16.0 L/100km city and 11.7 highway rating, which is actually pretty good compared to some full-size SUV rivals. Other than the obvious chromed styling enhancements and larger engine, multi-speedier transmission, standard 4WD configuration, and 20-inch rims, the XL Denali gets a standard magnetic ride control suspension, heavy-duty trailering package with an integrated trailer brake controller, transmission oil cooler, HID headlights with auto high beams, fog lamps, an acoustic laminated windshield, rain-sensing wipers, power-folding side mirrors, chrome-accented assist steps, proximity-sensing access with pushbutton ignition, a unique leather-clad interior, a heated leather-wrapped steering wheel, power-adjustable pedals, heated and ventilated power-adjustable front memory seats, an auto-dimming rearview mirror, a universal garage door remote, tri-zone auto climate control, 8.0-inch customizable colour TFT driver information display, a head-up display that projects key info on the windshield, a rear parking camera, OnStar with 4G LTE and a built-in Wi-Fi hotspot, wireless phone charging, active noise cancellation, 10-speaker Bose Centerpoint Surround audio, HD and satellite radio, front and rear parking sensors, blindspot monitoring with lane change alert and lane keep assist, forward collision alert, a safety alert driver’s seat, power-folding third-row seats, a powered liftgate, and plenty more. GMC is on a bit of a roll lately. OK, that's an understatement. While last year's U.S. sales were the best in more than a decade, its Canadian numbers were better than at any time in recent memory (we could only find records going back to 2002). What's more, General Motors' truck and SUV division is by far more popular in Canada than it is in the States, at least per capita.